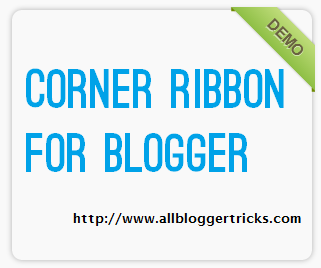 May bloggers may want to add a ribbon at the corner of their blog and this tutorial will show them how they can easily add a green ribbon at the corner of their blog. This ribbon is made up of Pure CSS and very less amount of coding thus it is fast loading. Unlike other ribbons no images are used as they increase the page load time. You can see the demo of this ribbon in the beside image itself. You can edit the text shown in the ribbon as per your convenience. To add this widget to your blog follow the below steps. You may add the ribbon on the blog as a whole or on a specific element like <div id="example">. To add this on any specific element just paste the below given code just below the elements starting. Change DEMO with your own desired text. After editing the code save the Template/Widget. You are done now. Now you and your visitors can see this elegant CSS ribbon on the corner of your blog. Cool widget i must say . how to add this only for specific pages? how to add post level(category) as corner ribbon to every post in home page of blogger?